Micro Carbonated Bottle Filler for bottles 12oz to 750 ml, beer, cider etc. Our new Micro carbonated bottle filler uses true pre-evac counter pressure technology to monitor bottle pressure and product pressure in controlling fills. The Micro Carbonated Bottle Filler can fill 12 oz bottles up to 24 bpm with the 4 Head, up to 30 bpm with the 6 Head, and up to 36 bpm on the 8 Head, depending on beer pressure and temperature. Any bottle size from around 12 oz up to 750 ml can be handled in the same machine with a series of manual adjustments and minimal change parts. Container handling is fully automatic – no manual loading or unloading of bottles. When ready, bottles are shuttled over and stopped under the filling heads. Our filling heads use genuine liquid pinch valves to control beer flow. Flow meters on each head allows for fine adjustments of the fill height. When complete, the bottles are transferred using hugger belts over to the crowning conveyor where a crown is crimped on the bottle. After completion bottles exit over to an accumulation table for pack off. *Option to substitute Crowner with Screw Capper or Corker. True pre-evac and CO2 charge prior to filling eliminates oxygen in the bottle. 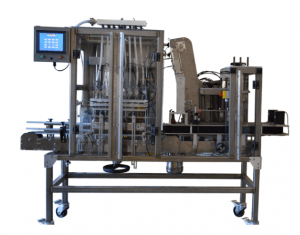 Automatic bottle-handling through the machine. No bottles are used to push other bottles through the filling process, eliminating the chance of misalignment. Can run any size bottle in the same machine.